We hit another milestone in our house this week. Kaydin lost her first tooth! 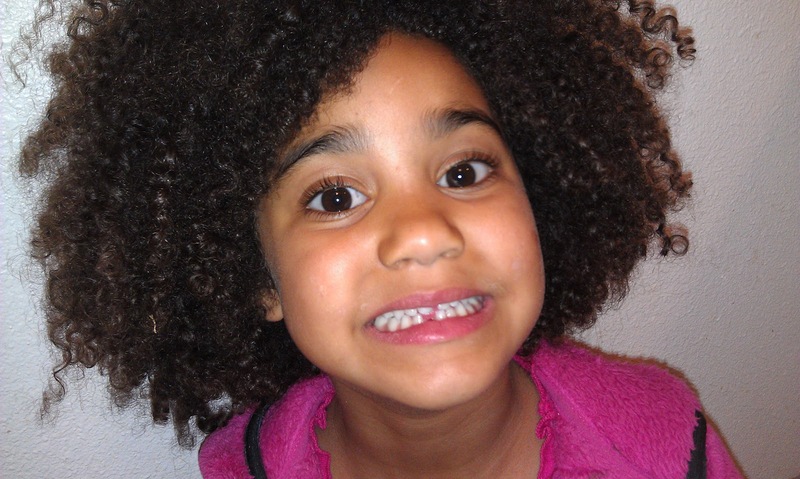 On Monday night she came running into my bedroom so excited yelling she had something to show me-- a very loose tooth. It was so wiggly I wasn't sure it was going to make it through the next day or even that evening. We weren't with Tim but she got on the phone with him right away to tell him the news! The next morning the first thing she asked me was if I remembered she had a loose tooth. I had actually forgotten but it was in the front of her mind, probably because it wiggled and moved so much she couldn't forget about it! I told her to make sure she didn't mess with it at school so we could all pull it together that night. 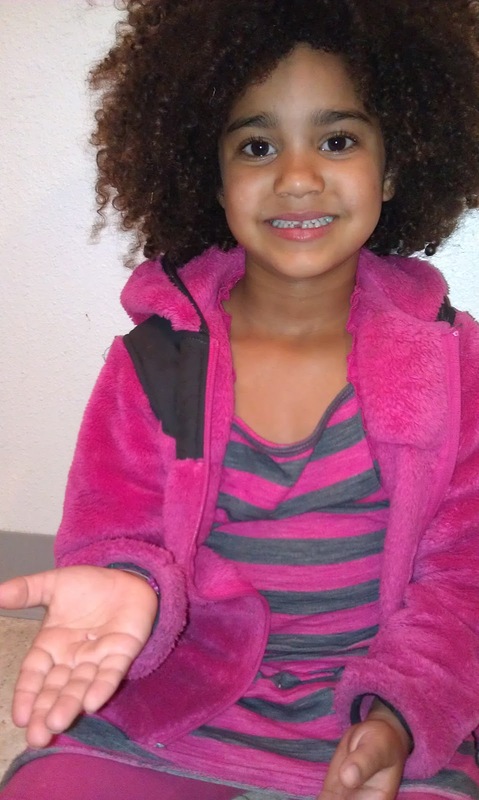 She was pretty anxious for Tim to help her get her tooth out so the Tooth Fairy could make a visit! First, Tim used a napkin and just gave it some wiggles to get the tooth loosened. Next, we tried the apple method. She bit into it a few times. It didn't really help too much so we alternated between Tim wiggling it and biting into the apple. There wasn't much more that could be done besides just pulling it out, it was so loose! Kaydin took her turn and did some wiggling on her own and the next thing we knew it was in her fingers! She was so excited and shocked when it finally came out! The tooth right next to it is also loose. I think the tooth fairy will be making another visit in the next week. It's interesting because those two bottom teeth to come in when she was about 9-10 months old. Oh, if only she could be small again. All the cliches about time passing too quickly are so true! She'll be starting kindergarten in August and the next thing we know she'll be moving off to college! 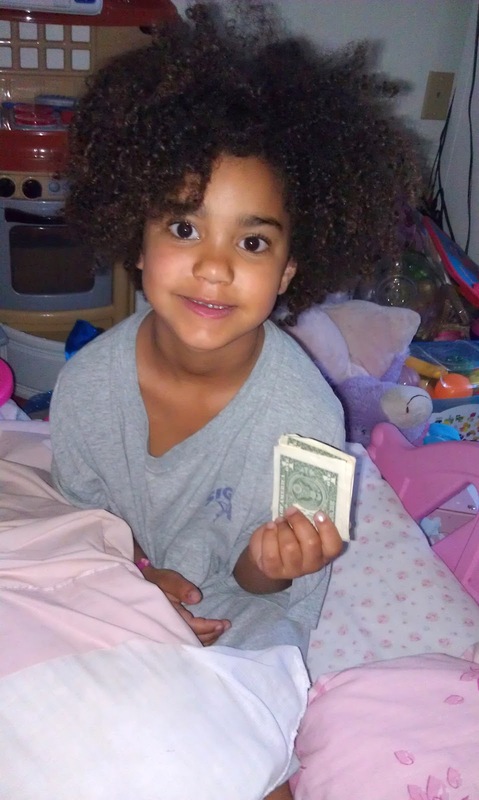 The next morning Kaydn lifted her pillow to find some $1 bills! The tooth fairy delivered! I have some video. I'll post it once I get it edited together.